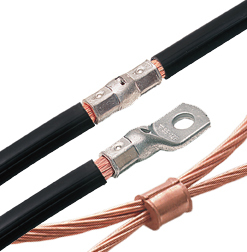 Terminals for 0.75 mm² to 1000 mm² Cu-conductors are made of 99.9% copper. As standards we make Elpress tube terminals (type KR/KRF/KRD), jointing sleeves (type KS/KSF/KSD) and Elpress C-sleeves, but also many customer-adapted connectors. The Elpress system suits both stranded conductors, in accordance with IEC 228 class 2, and flexible conductors, in accordance with IEC 228 class 5. * Elpress Copper Tube terminals (KR/KRF/KRD) are mainly used to connect to copper bus bars and apparatus outlets. * Elpress Through connectors (KS/KSF/KSD) are mainly used when joining copper cables in a cable installation. They can also be used for straight jointing of uninsulated ground wiring. * With a type C branch connector, grounding wiring used for lightning conductors or similar can be jointed and branched. Crimped Elpress Copper Tube terminals. In our standard range there are tube terminals with one or two holes, straight or angled at 45° and 90°, and terminals with dimensions in accordance with DIN 46235. In addition to these there are through connectors for service and road lighting cables (System 0616) and terminals and connectors for 10 mm² Excel cabling. Normally one crimp is needed for up to and including 150 mm² and two or three crimps for larger cross-sectional areas. Check the recommended number of crimps (see the pdf file crimping system, below) before crimping. Elpress Copper terminals are marked with a logo, conductor cross-sectional area and the type number for a hexagonal die. When crimping is completed with the correct tool, the Elpress dies stamp the insulating sleeve so that all connections can be checked afterwards.